Accuracy: 7 - It's a model of a model! Remember the sixties? That's when the the superpowers were slugging it out with the space race, the Soviets bringing out the Vostok, Voskhod and Soyuz and the Americans, the Mercury, Gemini, Command Service Module, and Lunar Module. That's seven spaceships in as many years. The number of models of each type also came out fast and thick. ^ Display base. You can faintly see the scribed outline of China. We then had to wait a decade for Space Shuttle models, another decade for Buran models, and then another decade the latest real spaceship in styrene, the Trumpeter 1/72 Chinese Spaceship, more commonly known as Shenzhou. Shenzhou 1 was successfully launched (unmanned) atop a Long March 2F (CZ-2F) on 19 November 1999. The design closely follows that of the Russian Soyuz, but is slightly larger. The major visual difference is in the orbital module, which is cylinder shaped and has its own solar panels. This is so that the orbital module can stay in orbit after the capsule is returned to Earth. It has been speculated that the module is being used for military purposes, for example photo-reconnaisance of other nations. Shenzhou's 2 to 4 were also successfully launched unmanned, with the most recent launch on 15 October 2003, Shenzhou 5 carrying China's first "yuhangyuans", Yang Liwei into orbit for 21 hours 23 minutes, before returning to China. When Trumpeter annouced a 1/72 Shenzhou kit, I was very surprised by the scale chosen. Dragon had released a giant 1/48 CZ-2F kit and with the recent trend in larger models, I would have expected a larger scale from Trumpeter. 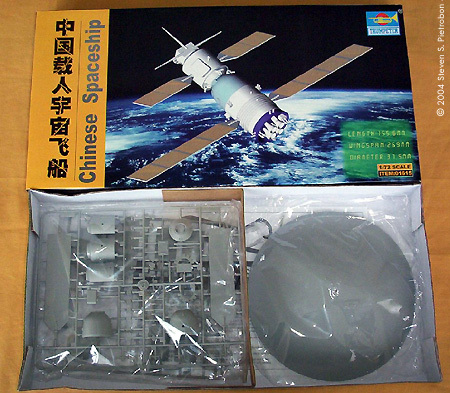 The reason may be due to that this appears to be a scaled down version of 1/40 Shenzhou that was given out by the Chinese Astronautical Technology Research Group. The giveaway are the engines, which are cone-shaped and in reality would have been bell shaped. Other details also appear identical between the two models, although one difference are the three "prongs" on the orbital module have been extended. 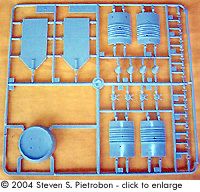 This continues the fine tradition of real space styrene models not being accurate! The box is long and thin, with black and white photos on one side showing photos of the triumphunt return of Yang Liwei with "Great Leap Skyward" on a copy of the China Daily newspaper. This brings back memories of Revell's 1/110 "Newspaper" Mercury-Redstone kit from over 40 years ago, celebrating Alan Shepard's first flight. 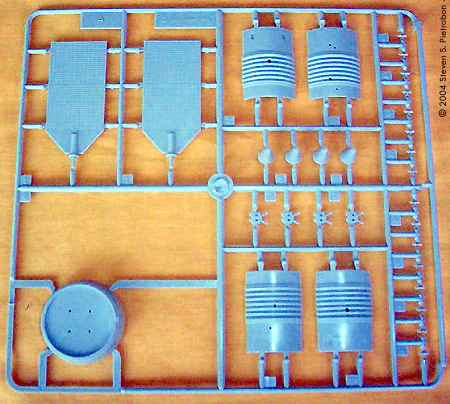 Inside the box are three clear plastic bags, two of which contain grey styene sprues of 82 parts to put together the Shenzhou. The other bag contains a large round grey styene base with the map of China (including Taiwan) engraved on it. Also in this bag is a metal rod embedded in a tube of clear plastic. The instructions show that this should be bent into an S shape to hold up the model. I was disappointed that there were no painting instructions or decals. Good photos of the actual vehicle are rare, but some can be found in the Encyclopedia Astronautica. One should be careful with using pre-launch photos though, as various blankets and other material can be added shortly before launch. 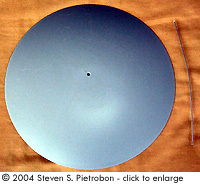 Unusually, the round service module is made in four quarters and the orbital module in three thirds. The descent module is in the normal two halves. 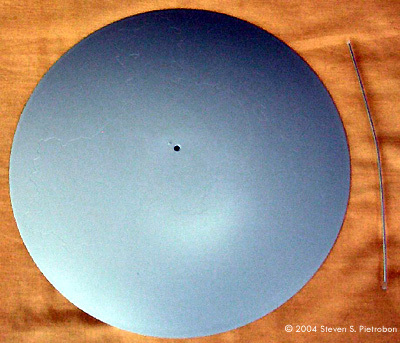 The service and orbital modules have nice indented holes to place the solar panels. This appears to be so the panels can be placed without glue so that you can appreciate the various orientations of the panels (in others words - have fun playing with them). I only found a tiny anount of flash on one part which will easily be cleaned up. Other than that, the molding appears perfect. This is great little kit that all space modellers will appreciate. Since it appears to be model of a model, there will be a number of inaccuracies, the most obvious one being the engine nozzles. As time goes by, more photos of Shenzhou will appear which will allow us to build a fitting example of this fine spaceship. 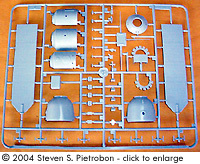 This page copyright © 2004 Starship Modeler. Last updated on 3 June 2004.